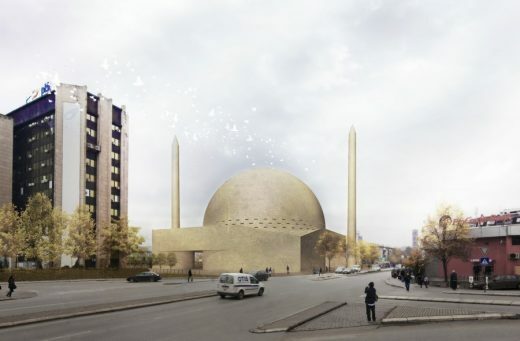 The new Central Mosque occupies a strategic position within the extended urban centre of Prishtina. The main urban road limits two distinct, modern parts of the city here while buildings of outstanding scale and importance are aligned along this mayor car traffic route, which also forms the eastern limit of the project site. A mayor pedestrian route, dense with people throughout the day defines its southern side. At the crossing of these two traffic routes, the once radical planning ideas of separation of the pedestrian from the vehicular traffic meet the poor urban reality. The immediate surroundings of the project site could be described as unfinished and heterogeneous. Beside the flows of vehicles and pedestrians, the expressive topography is its strongest formative feature. But any mosque primarily relates to the higher, universal order. Situated close to the boulevard at the highest level of the given terrain, this mosque clearly points the qiblah axis of prayer, its one and only reference. It relates to natural laws only in terms of structure and basic climatic protection; to its urban surroundings only in terms of necessary adjustments to the actual topography. Disposition of the minor parts of the programme such as shops and spaces of socialization adapts to the urban context. While facilitating the movement and the access of people, they form a base for the mosque, elevated on a platform above the urban setting. Three minarets anchor the hierarchical composition and emphasize its relation to the given topography, helping to orientate the flow of people around the mosque and in the total urban space of Prishtina. Predominant use of the one single material, yellow- brownish limestone from local quarries, underlines the unity and the continuity of the overall composition devoid of any symbolic association. This unique and simple outside appearance is paired with the sublime physical and spatial experience in the huge void in its interior. THE BASE: A total of 1088 parking spaces are organized in four underground levels. Two- levels base is divided in two interconnected parts with a wide gap with gently sloped staircases- ramps between them, connecting the different levels of the terrain around the project site and bringing the daylight to both the levels of the base. The front plan defining the western facade of the new square in front of the mosque is occupied by the two level slab with shops, school, kindergarten and imam’s apartment. Shops are aligned along the western and southern facades and along the internal corridors, a covered bazaar with entrance from the crossing of pedestrian routes. Islamic cultural centre is housed in the double height space right under the mosque. Floor of the social areas declines following the inclination of the outdoor ramp and diversifying the social spaces to those more intimate in lower and those more open in the higher spaces. Conference hall in the centre of this area benefits from this level change too. A large concentric corridor around it with extensions to the sides facilitates its use by a large number of people. Large ablution areas for men and women are connected by staircases directly with the respective entrance spaces for men and for women in the upper level. The entire base has a continuous, neutral appearance dominated by the repetition of the vertical division on its exterior and interior facades. A system of ramps connects two levels and roofs of the base, itself a platform for the dominant mass of the mosque on its top. THE MOSQUE: The prayer space is divided into three levels: the main prayer area for men in the ground floor with around 1500 places, the additional prayer area for men in the first gallery with around 2050 places and the prayer area for women in the second gallery with around 2500 places. Additional 500 prayer spaces for men are possible in the entrance porch. The mosque is composed of a double cylinder, a dome, a triangular prism pointing to Kaaba and a raised horizontal slab with galleries extended from the cylinder to form a covered porch in front of the entrances to the mosque. The porch flanked by two convex walls that uphold the galleries is designed as a semi public space which narrows and widens in accordance to the flow and gathering of people. An ablution fountain for men is placed within, protected from the street life but open to the views of the city. A group of benches around it offer a pleasant space for gathering between the prayers. Entrance for women with monumental stairs and two elevators is from this porch too. Entrance space for men is a crescent shaped double corridor (with and without shoes) around the main prayer area with monumental stairs to the first gallery and to the ablution spaces in the basement. The entrance from this corridor to the main prayer space is inclined to the kibla direction; any direct visual contact between the prayer area and the outside space is omitted. The main prayer hall is a cylinder with the second gallery hovering over its back part. The kibla wall in its front is higher than the ring supporting the dome with a large mihrab niche in its centre. A high and narrow gap in this wall clearly marks the direction of prayer. In prayers with a great number of believers present, the imam leads the prayer right in front of this gap, while the mihrab niche works like a reverberation box of a musical instrument. Prayers with up to seventy believers can be held also inside the reverberation box with kibla direction clearly marked at its front wall. A modest mimbar is situated at the side of the mihrab with entrance for imam directly from its office in the basement hidden behind it. One hundred and fourteen holes- book shelves adore the kiblah wall. Like small prisms, they diffract the daylight bringing it to the believers at prayer just like one hundred and fourteen chapters of the holly Quran bring the light to the whole of humanity. THE DOME: The dome of fifty metres in diameter rests on the continuous concrete ring held by the curved concrete wall and columns. Its structure and materiality corresponds to the method and technique of its construction. Its inner shell, a sort of geodesic dome, is tessellated in a thousand low pyramids on triangular bases with sides in range from 2.30 to 3.00 metres and height of around 20cm. Made in sand- blasted stainless steel plates, they are joined together in quasi horizontal rows, from outside additionally connected with a continuous iron reinforcement mesh. As this sub- structure grows vertically, a thin layer (10- 20cm) of the reinforced concrete is sprayed from outside. Scaffolding during the construction period, the steel pyramids at the same time work as the lower reinforcement zone of the concrete dome and also form its final interior layer. Its final outside layer is formed of stone plates on a steel substructure. Same as the final layer of the outdoor walls, only in a smaller scale of its parts; it emphasizes the monolithic character of the overall volume. The daylight penetrates the interior space through the two rows of the thin horizontal gaps in the lowest part of the dome. Right behind the mihrab, the light penetrates through additional gaps in the wall of the outside cylinder too. In the view from the prayer hall, the source of light is hidden behind the high inner cylinder of the kiblah wall. Diffraction of light while its direct source remains invisible from the prayer hall is meant to suggest the effect of floating of the giant abstract pattern over the prayer space. Clear direction of prayer, strong structural pattern and indirect light are the only elements that constitute this pure and clean space. THE MINARETS: Three minarets of varying heights anchor the composition of volumes in its immediate urban surrounding and in the skyline of the entire city. The highest one, 70m high, situated by the road marks the entrance porch. The second one, 10m lower, marks the access to the cultural centre under the mosque and the inflection point of the two ramps within the gap between the two parts of the base. The third minaret is another 6m lower, situated at the lowest point of the ramp, already at the level of the pedestrian connection to the bazaar. This lowest minaret is not of the minor importance. A wider cylinder with fire escape stairs inside forms its base and a sherife balcony is situated on its top. The concave wall behind it would magnify the sound of the call for prayer, turned to the site where the greatest part of the congregation is expected to come from. Construction techniques and methods are designed as technologically suitable to the local labour and material conditions. In spite the large size, the total costs estimate at 32 million €.